Romeo Ferraris has unveiled his latest dramatic project which takes the Abarth 500 performance theme to its most extreme level yet, the 500 Monza boasts 260 bhp and was appropriately unveiled at the weekend's 60th Gran Premio d’Italia. Leading Italian tuner and race team owner Romeo Ferraris has unveiled his latest dramatic project which takes the Abarth 500 performance enhancement theme to its most extreme level yet; the 500 Monza boasts 260 bhp and was appropriately unveiled over the weekend during the 60th Gran Premio d’Italia which took place at the Autodromo Nazionale Monza. This amazingly powerful car sees more synergies with the Monza circuit where Romeo Ferraris-tuned cars have scored many racing triumphs as it bears the famous red, white and blue colours of the evocative track which is the long time home of Italy's annual Formula 1 grand prix. Romeo Ferraris was born in Milan 1937 and he cut his teeth as a tuner in the 1950s boosting the power output of the original Fiat 500. He started his long career off in the workshops of Angelo Dagrada in Milan, where he learned the basics of his "art". His exploits with the tiny Fiat cars earned victories for Zanetti in two categories of the Turismo Championship in 1967, and his successes here, and his interest in the "sports prototype" cars, led to another Fiat-based project, developing a 1000cc engine with 136 bhp at 11,300 rpm that was derived from the Fiat 128 unit. Studying the experience of the English BRMs, he followed this up with the "2000 Prototipi", a 350 bhp V8 that was dubbed as the "Italian Cosworth" and went on to be used with distinction by Arturo Merzario in his racers, dubbed as the Lola-Ferraris. Thus the legend of Romeo Ferraris was born and it was also helped along by his tuning programmes for BMWs, including shoe-horning the 3.3 litre 6-cylinder CSL into the 2002 Ti. The tuning result was 400 bhp and Ferraris himself admitted himself that "these are cars for brave ones." After successes in the European Touring Car Championship at the start of the 1980s he turned his back on the track to spend a decade tuning powerboats, and the result was a string of winners and record breakers. In the early 1990s he returned to the tracks though, tuning cars for a range of modern and historic competitions, including tweaking the Ford Mustang. This year Romeo Ferraris is as busy as ever, running a team of Abarth 500 Assetto Corse's in the new Trofeo Abarth 500 series, in the Italian GT Championship with a Ferrari F430 GTS and in the Italian Turismo Endurance Championship with an Alfa 147 Cup and Renault Clio Cup, while the pride of the race factory in Milan is the new Abarth 500 24 hr, a car created entirely from scratch and equipped with a turbo engine that pumps out more than 350 bhp. The Milanese tuner has now put all his knowledge to work with the "500 Monza by Romeo Ferraris" which turns out 260 bhp from the Abarth 500's 1.4 litre turbo engine. 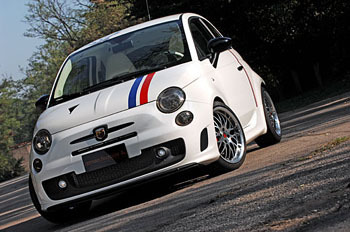 The Abarth car comes with a standard 135 bhp from the showroom meaning that its horsepower has almost doubled. 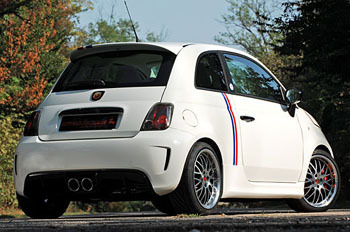 Finished in bianco ghiaccio (ice white) and with blue and red strips that dash up the bonnet, rear three-quarter panels and over the tailgate spoiler, the colours illustrate the car's Monza nametag, while the circuit's famous badge is embossed on a large decal splayed at an angle across the roof. There are discreet Monza logos on the B-pillar covers, that feature in the round turret-effect badge of the track which houses a small map of the track, as well as a new Naca duct on the bonnet to increase air intake and a new prominent horizontal lip spoiler at the front. To cope with the huge increase in power the 500 Monza by Romeo Ferraris has a new differential fitted, bigger Brembo brake calipers and perforated discs, new alloy wheels (with Romeo Ferraris hub caps) and is also clearly identifiable by the big twin round exhaust tail pipes that emerge from the centre of the rear bumper section. Just ten examples will be built, with a price tag of around 60,000 euros, although this hasn't been fixed yet. Each one will come with a numbered brass plaque on the dashboard with the new owner's name etched into it above the car's individual number. The "ice white" theme of the exterior is replicated inside with a white dashboard, leather steering wheel, centre console and a gleaming pelle bianco leather and Alcantara interior. The sea of white continues through to the side panels and roof lining while the seats (the front ones are now 'bucket' style racing seats) also replicate the exterior red/blue strip effect which is complimented by a smaller red dash on the top-centre steering wheel. In contrast the top of the dashboard and the instrument covers are covered in black Alcantara. The Monza badges also feature on the front seat headrest sections and on the lower part of the steering wheel. Completing the effect is a set of exclusive carbon fibre luggage bags made out of white leather and carbon-fibre.